Have you ever had one of those amazing friends, the kind who will not only come over and pack up the house you're moving from, but also remember to bring plastic champagne flutes and a bottle of bubbly to the house you're moving TO? Who will cheerfully pick up your kids from school with zero notice when you have a meeting run late? Who drives you to the airport for a 6 am check-in? Who comes over to your house for dinner and doesn't leave until she has your kitchen spotless? Who loves and teaches your children, and who loves and teaches you? I have that friend. And she is my sister. As well as my new co-blogger here. In her previous product review, Tami announced that she was looking for a jog stroller because she had found out on New Year's Eve that she was pregnant. This was great news, because her husband's paralysis back in 2007 had put their family-building on hold. Gino had just recovered enough to resume his job as a police officer, right at the first of the year -- perfect timing. Well, Tami and Gino found out last week that the baby had stopped growing. She was able to have the miscarriage without medical intervention over the holiday weekend, and yesterday's ultrasound shows that she is doing as well, physically, as can be expected. My sister is incredibly resilient. She is also doing amazingly well emotionally. But I ask you, many of you who haven't yet had a chance to absorb her wonderfulness, I ask you to either leave your words of support for Tami and Gino below, or over on her solo blog. She has not yet written a post about this latest turn of events (not sure she will), but you can leave a comment for her and Gino here. She'll still be reviewing. Stay tuned. And thanks, from me, for your support of my sister, whom I love deeply. See the cool stuff our classmates are showing and telling over at Mel's Show & Tell. 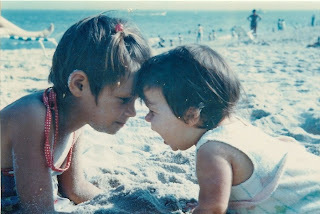 Image: Me and Tami, circa 1970, Asbury Park, NJ. Story here. Tami and Gino, I'm sorry for your loss. Tami and Gino, I am so sorry for your loss. My thoughts and prayers are with you. Tami and Gino, I know how hard this is. I'm so sorry you have to experience it. I'm glad you have a loving a supportive family to see you through. My heart aches for you, Tami and Gino. I truly hope you are able to find solace soon. My thoughts and prayers are with you. so so sorry, tami and gino. so sad. I'm so sorry, for all of you. Also sorry that you had to become an official member of the ALI community through personal experience, rather than a member by proxy. Heartbreaking. I'm sorry for your loss, Tami and Gino. Thoughts and prayers being sent. Here from Show & Tell and wanted to say how very sorry I am for you, Tami & Gino. I, too, recently suffered a m/c after my sweet baby girl stopped growing. There is nothing that can be said to make the situation better, but know that there are a lot of people thinking about your baby and praying for you. Tami and Gino -- I am sending you all kinds of hugs and loving, until I can physically be with you in a couple of weeks. I love you and am thinking of you! I am so sorry for your family's loss, Tami and Gino. My thoughts are with Tami and Gino. A loss like that is so hard. Wishing them peace and healing. Tami and Gino, I'm so sorry for your loss. Praying for you! My heart is with you, Tami and Gino. I'm so sorry that you're going through this right now.